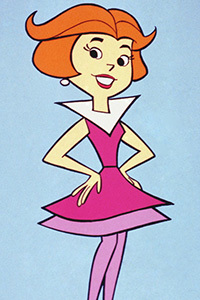 I always wanted to be a Jetson, even if Mr. Jetson, would on occasion, act like a misogynist pig. That cute, colorful precursor to Star Wars gave us a peak into the future -microwave oven and all! Mrs. Jeston, my alter ego, never broke a sweat when it came to dinnertime. Once the arduous task of determining what each individual diner desired, and all the appropriate buttons on her magical food machine were pushed, she could look in the mirror and not blanche. No shopping, no prepping, no slaving over a hot stove – but was she at peace with her inner housewife? Where was the labor of love? How did she woo her man if not through his stomach? Or do TV dinners count? One way or another we all learn that having one’s own personal robot maid and two precocious children -one devilish boy, one pretty if slightly dense girl is not always enough. Is it too much too ask for two personal robot maids? And a nanny?